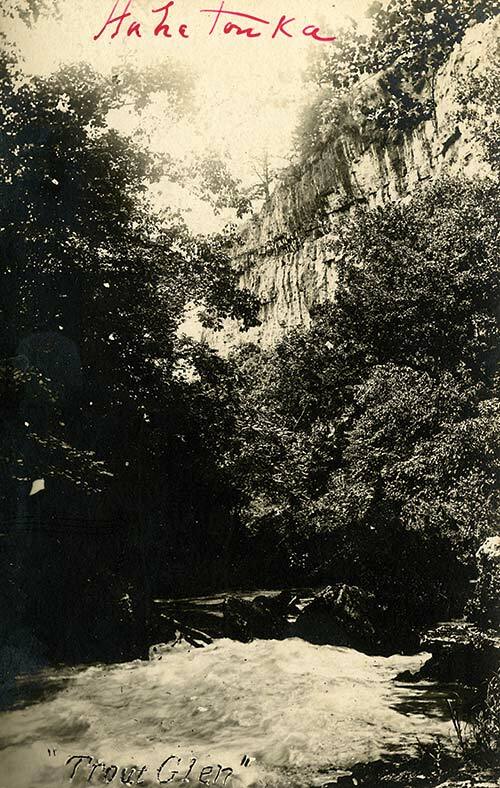 Entitled “Trout Glen” and written in red ink “Ha ha ton ka,” this real photo postcard was published by Jas. Bruin, Linn Creek, MO. Unsent. 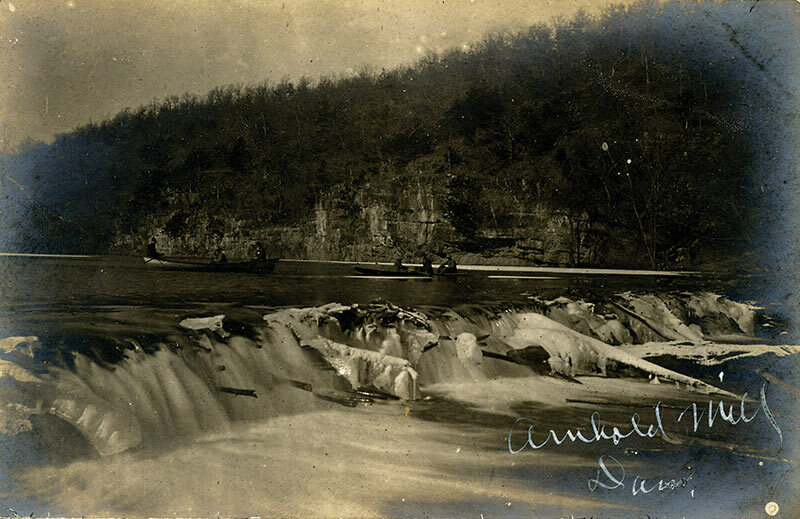 Before Bagnell Dam, this spring outlet fed into the Niangua River. 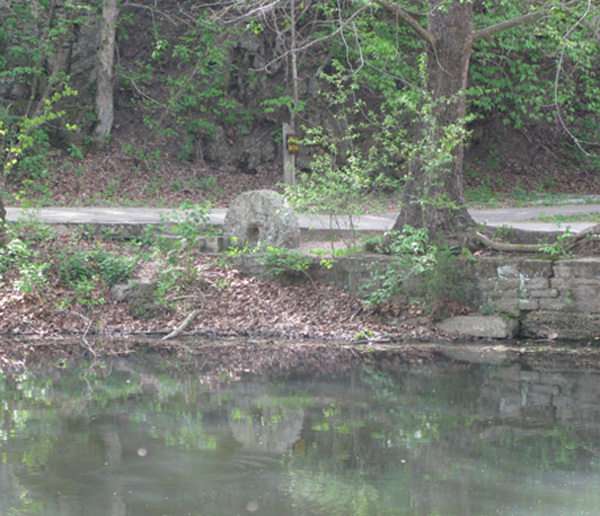 Springs throughout the Ozarks were stocked with several varieties of trout beginning in the late 1800s. Trout and even salmon were also dumped into streams that were too warm for their survival. Rainbows from the McCloud River in California proved to be the hardiest. In very few of these environments will they reproduce. Robert McClure Snyder put in a small dam and a mill on this spring branch, creating a cool pool for trout. 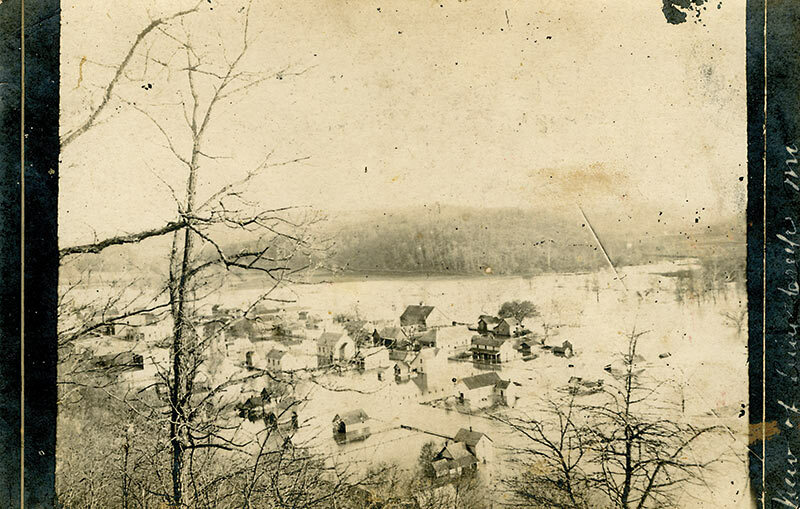 The pond was swamped by the warm muddy waters of the Osage as it backed up and spread out when Bagnell Dam closed. The loss of the trout pond was one justification for the Snyder family’s lawsuit against Union Electric. The millstone is embedded in the concrete today as a decorative element along the path. Given an abundant water source, like a spring-fed Ozark stream, one of the first things pioneers often did was build a water mill. 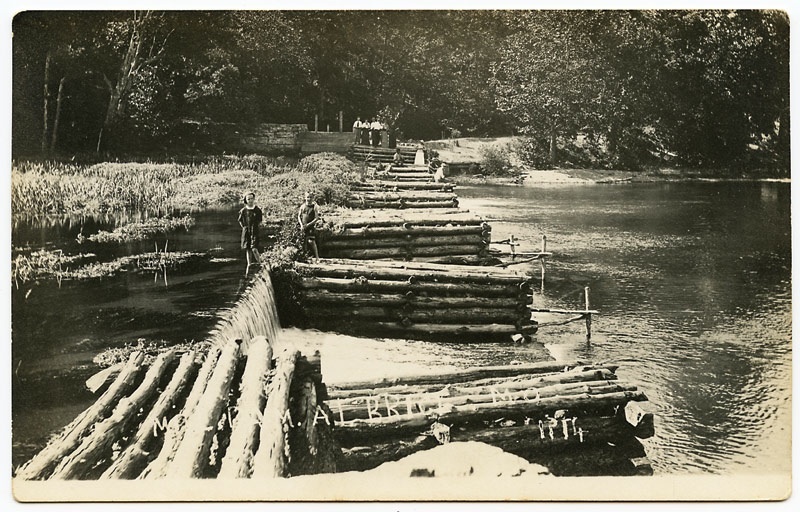 The dams began as crude wood obstructions like the one seen here at Brice Springs – now called Bennett Springs, a Missouri state park. Once established and powering mills, owners then began to add stone and concrete to strengthen the small dams. Among the first settlers on this branch flowing into the Niangua River was James Brice, who established his mill in 1846. Although several other mills were built here at different times, the most successful mill was operated by Peter Bennett, Brice’s son-in-law. Eventually, Bennett became the namesake for the spring, and later, the park. The spring valley became a popular camping ground for farmers while waiting for their grain to be ground at the Bennett mill. 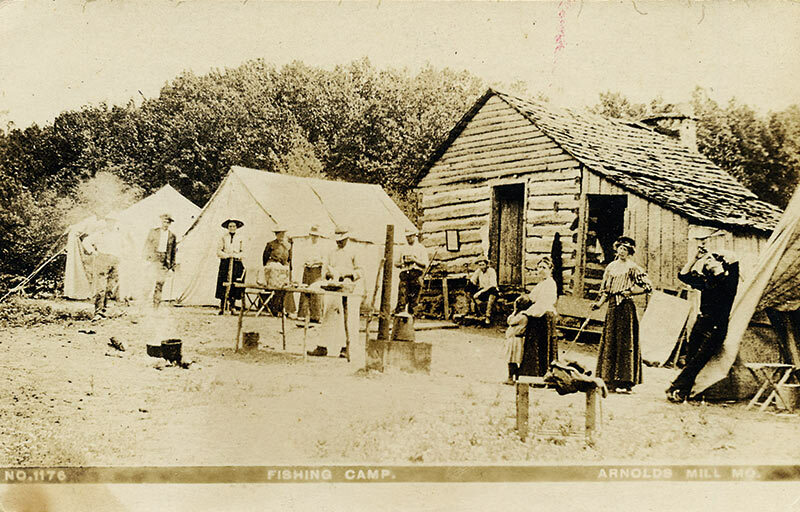 To pass time, campers would fish, hunt and visit with local residents..
By the turn of the century, recreation was gaining in importance. Already a favorite spot among fishermen, in 1900 the Missouri Fish Commissioner introduced 40,000 mountain trout into the spring. A privately owned fish hatchery was built in 1923. 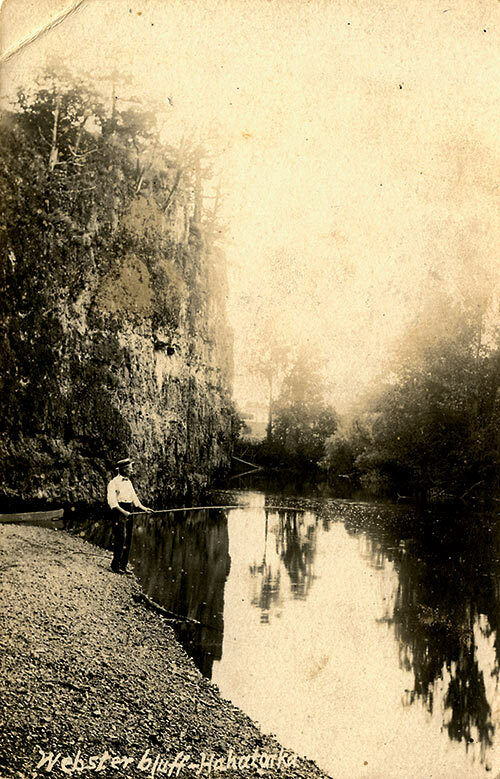 In 1924, the state purchased the spring and part of the surrounding area to create one of the first state parks. The park is now owned and operated by the Missouri Department of Natural Resources; the Missouri Department of Conservation operates the trout hatchery. While there is nothing left of the Brice Spring era, the park was extensively remodeled by WPA workers in the Adirondacks style in the 1930s. 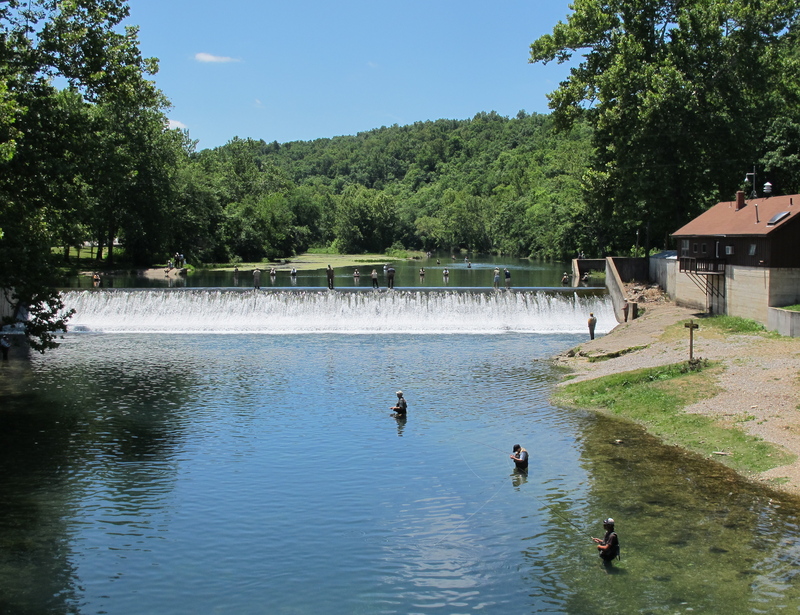 Today, Bennett Spring, which has a daily average flow of more than 100 million gallons, is one of Missouri’s most popular state parks.